The summer tournament is now underway, on Sunday we had our first week of games: the qualification week. It’s early yet but one week of four games per team has given every team plenty of games to prove themselves. So now for the first time, here’s our Weekly Roundup. The biggest winner this week was Team Blobzy, not only did they climb 11 places but they also did part of it on stream with an upset victory as the 25th seed vs 9th seed. That match will also be our Featured Match for this week. Every week one of the matches from the stream will be picked to be our featured match and a match report/analysis will be done for it. So without further ado, here is our first featured match. 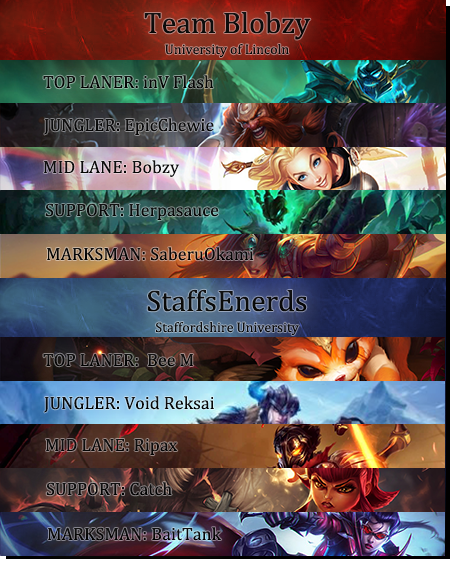 Looking at the team compositions, the StaffsEnerds went for a simple, scaling composition aimed at teamfighting using the big ultimates on Gnar and Sejuani alongside the AoE from Viktor and with Vayne just being Vayne. On the other hand Team Blobzy went for a pick composition. Lux’s Light Binding, Thresh’s Death Sentence, Gragas’s ultimate Explosive Cask and the sheer movement speed bought by Sivir and Hecarim excel at catching small groups or solo enemies unprepared. The game began with standard lanes, Vayne has a good matchup into Sivir so there was no incentive for that weak-in-lane champion to swap this game. After 9 minutes of laning Gnar jumped on Hecarim with his ultimate but died for it since Gragas ganked simultaneously, giving First Blood to Hecarim. Staffs responded with a dragon on the other side of the map and would have been happy with that trade, but not when First Blood let Hecarim get a solokill on Gnar 2 minutes later. Sejuani tried to help the Gnar but a counter gank from Gragas got another two kills for the team from Lincoln and they now had a 4-0 Hecarim in the top lane. The StaffsEnerds responded by doing a lane swap immediately. This got them the turret top lane but lost them a dragon and gave Hecarim another kill when Sejuani tried and failed to steal it. Despite all this the gold remained extremely close since both Viktor and Vayne had large cs leads over their opponents, Vayne had even got bot turret before the lane swap. The game was now Hecarim’s to control. He charged onto Viktor for a kill in mid lane, and then teleport-homeguard dove Gnar bot lane for yet another alongside the first turret for the team from Lincoln, despite this they only had a 1k gold lead. That lead decreased when Staffs rotated for a free turret in mid lane. Hecarim tried an engage when it went down but his team wasn’t in position resulting in an ace-for-two going the way of Staffs giving them a 2.5k lead and mid second tier turret. Staffs got another teamfight going their way a few minutes later on the back of a great ultimate from the Annie support (who was building heavy damage with Haunting Guise and Sorcerer’s Shoes). Vayne was now extremely fed with 6 of her team’s 9 kills. For the next 12 minutes both teams got victories from their compositions strengths. Team Blobzy when they got picks and the StaffsEnerds when they got teamfights. By 37 minutes the game was still mostly even but then Staffs made a mistake. In their lust for teamfights they did what Team Blobzy did earlier: took a poor engage without their full team to follow up. Team Blobzy happily accepted the four kills advantage and ran with it, they took an easy baron and then moved to the dragon. By then Staffs had spawned and moved to contest it. Moved right into the path of a rampaging horsey, Hecarim charged down Viktor then disengaged safely giving his team a 1-man advantage on the dragon. They used that extra man and sent Sivir mid to push while the other four attempted the dragon. They never got that dragon though, this time Sejuani succeeded in stealing it in exchange for her life. But meanwhile Sivir had gotten the inhibitor turret in mid lane. This allowed Team Blobzy to charge mid lane to the inhibitor (running down the newly respawned Viktor in the process). Now with a 5v3 they ran to the Nexus. By the time Viktor respawned again both turrets were gone and there were dead members from both sides. The extremely long teamfight ends with only Hecarim alive for Team Blobzy and Viktor barely escapes to the fountain with his life. As the only one alive for his team, Viktor couldn’t prevent the monstrously fed Hecarim and the baron minions from destroying the nexus and ending the game. Team Blobzy from Lincoln win!